This took me forever to read. It was just really hard to get into until I forced myself to sit down and blitz through it last night. Part of the problem is the descriptive language seemed so off the wall sometimes, I thought I was reading something by Stephenie Meyer or E.L. James which is not a compliment at all. Not to say that it was bizarrely immature figurative language, just... odd. In hindsight, I suppose that is what happens when the author is a highly educated person such as a doctor as Ahmed is. It's sort of like those common proverbs translated into lawyer-speak worksheets we used to get in school. After I got over that bit, it was quite interesting. The feelings I had during reading were similar to that which I experienced when reading The Feminine Mystique. As a female reader, many things will make you mad or upset. It's definitely not a book for anyone who is sensitive to triggers, particularly those related to sexual discrimination or assault (this is about the country where all women, regardless of nationality or religion, are required to be veiled in public at all times and it just goes downhill from there) and 9/11. Qanta Ahmed is an American by choice, born in England from a Pakistani family, and you sure can tell. One thing I realized when traveling is that anyone in any country or culture can be of any personality, good or bad; yet there is something about where and how you grow up that indelibly structures the foundation of your core beliefs of how the world should work and everything you else you experience in life is built around that foundation. Ahmed definitely has the Western value system that women are not meant to be invisible or weak, and the whole book is her trying to reconcile her values with her religion as it is practiced in Saudi Arabia. If the country follows religious law, Islamic law at that, shouldn't everything be fine? But she repeatedly runs into examples of how everyone, even the privileged figures of native Saudi males, live in a mind-bending dichotomy of constant fear of the religious police and reckless abandon with their lives and that of everyone around them. 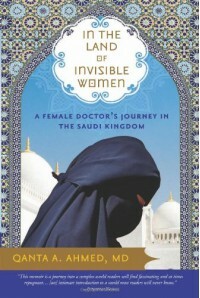 Her critical eye noted many things, presenting a rather balanced view of life in Saudi Arabia, as much as a female expat can have anyway. There are good and bad things, and mostly she spends the book working out her feelings and thoughts about them. The longest running train of thought is, of course, how women fit into their place in Islamic culture and how the teachings of the faith are corrupted for sociopolitical gain. The one glaring arrogance from Ahmed, however, is that the whole reason she decided to go to Saudi Arabia in the first place was that she thought she would fit in just fine, having been raised Muslim, without thinking about how cultural influences and national law would mean her notion of female independence as a right would be turned upside down. This also leads into her problem with relating to the people she meets abroad because what is instinctively repulsive to her is natural to them. Likewise, her ingrained tolerance for people of other races and religions is a product of growing up in the UK and America, so she is doubly shocked by the racism and anti-Semitism and anti-Americanism she experiences; I've been there myself, but still, why are people always surprised that the rest of world doesn't think kindly of the Western powers? That, again, is another example of arrogance. These negatives do not detract from the story however.